Inter are holding out for a massive fee for Dutch midfielder Sneijder, but have hinted a deal involving cash plus either Michael Essien or Florent Malouda might clinch a move. Chelsea face competition from both Manchester clubs. Guus Hiddink, expected to be named as Chelsea’s new manager next week when a settlement deal with the Turkish Football Federation is thrashed out, has singled out Sneijder as one of the key players he wants. 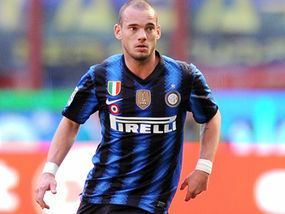 Chelsea owner Roman Abramovich is still reluctant to meet Inter’s massive price for the 26-year-old – and even more of an obstacle is Sneijder’s massive £175,000 a week wages. Now the west Londoners will sit down with Inter chiefs, including director of football Marco Branca, in order to discuss the transfer of the man who cost the Nerazzurri £13million two-years ago. The former Real Madrid playmaker was strongly mooted as a replacement for Paul Scholes at Old Trafford, and now that Chelsea have made their move, Sir Alex Ferguson could be forced into launching a counter bid in the next few days.